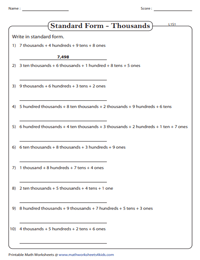 This compilation of place value worksheets is best suited for students of 2nd, 3rd and 4th grades. 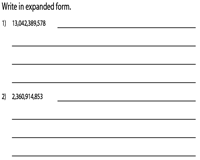 Learners are required to convert numbers in standard form to expanded word form and vice versa. Worksheets are classified into place values of units, thousands, millions, and billions to enable an easy download environment. Numbers are provided in standard form. 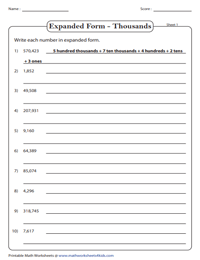 Showcase the place value of each digit by rewriting them in expanded place value word form. The first one is solved for you. Click here for all related PDF files. 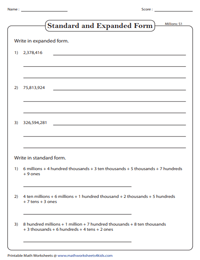 Observe the place values given in the expanded word form in the level 1 worksheets and transform them to standard form. Level 2 requires learners to regroup numbers in units place and then rewrite them in standard form. Students are first required to modify standard numeric notation to expanded place value word form. Then, convert expanded written notation back to standard form. 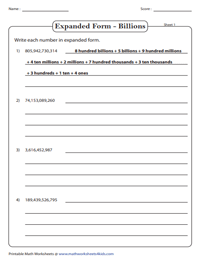 This series of worksheets features 4-digit, 5-digit, and 6-digit numbers. Break down each single digit to convert them into expanded word form. 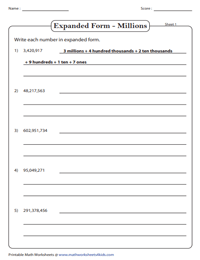 Level 1 worksheets contain numbers in expanded place value word form. Rewrite them in standard form. Level 2 requires students to first regroup numbers in thousands place and then convert them into standard form. 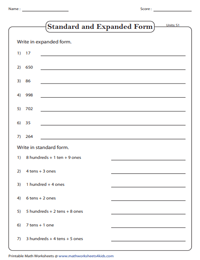 Click here for an assortment of worksheets that have numbers displayed in both standard form and expanded written notation. Study each 7-digit, 8-digit and 9-digit number featured here. 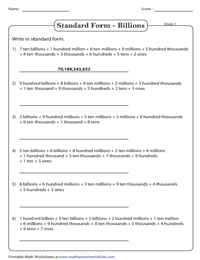 Write each number (in millions) in expanded word form. 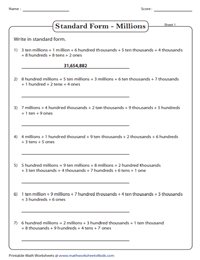 Displayed here are numbers in expanded place value word form up to hundred millions. Rewrite in standard numeric notation. 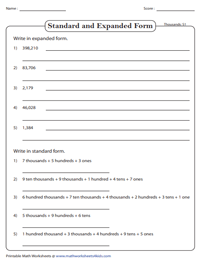 Each worksheet contains two sections. 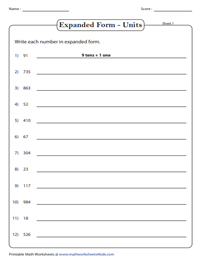 In the first section, write the numbers in expaned word form. In the second section, express each number in standard form. 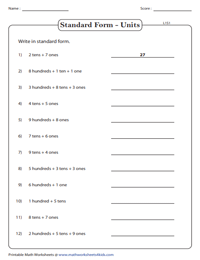 Focus on the placement of commas in this set of worksheets that comprise 10-digit, 11-digit and 12- digit numbers, to rewrite them accurately in expanded place value word form. Each number (in billions) written in expanded word form. Convert them into standard numeric notation. Get students to transform numbers given in standard numeric notation to expanded place value word form and contrariwise. Click on the 'Download the set' option to obtain all worksheets under this topic.